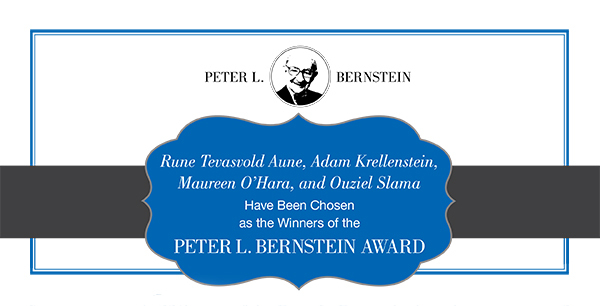 The award was established in 1999 to honor Editors Peter L. Bernstein and Frank J. Fabozzi for their extraordinary contributions to the field of finance and promote research excellence in the theory and practice of portfolio management. Co-founded and funded by Jacobs Levy Equity Management, the prize for Best Article Award is $2,500 with the following three articles receiving Outstanding Article Awards and $1,000 prize. 2017 Andrew W. Lo What Is An Index? 2012 Wai Lee Risk-Based Asset Allocation: A New Answer To An Old Question? 2011 Robert A. Jarrow Active Portfolio Management and Positive Alphas: Fact or Fantasy? 2003 Clifford S. Asness, Robert J. Krail, and John M. Liew Do Hedge Funds Hedge? 2000 Thomas K. Philips Why Do Valuation Ratios Forecast Long-Term Equity Returns? This annual award, voted for by an independent panel of judges, honors the most thought-leading and influential research that has been published over the past year in any of the IPR Journal titles. It was created on behalf of Peter L. Bernstein, the celebrated economic historian and founder of The Journal of Portfolio Management. Funded by Research Affiliates, LLC, the prize for the winning article is $5,000. Wai Lee Risk-Based Asset Allocation: A New Answer to an Old Question? This new annual award, first awarded in 2019, recognizes the outstanding contributions to academic knowledge by a single individual.